Most of the time, when you find something that’s not yours and you turn it in, it’s not like you’re expecting a huge thank you, a burst of applause or a ticker tape parade. You do the right thing because it’s the right thing — but if you did happen to turn in a lost diamond ring at Newark Airport? You’ve got a free flight. 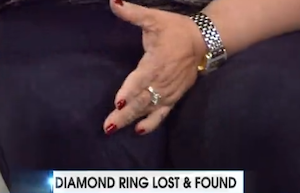 It’s a mystery that once solved, will result in a free $500 flight voucher for whoever the Good Samaritan was that found the 4-carat ring on Valentine’s Day this year, reports the New York Post. The 52-year-old woman who accidentally dropped it that day during security screening didn’t even realize it was gone until she was already on a plane to London. Many might’ve bidden the bauble goodbye, but someone found it and turned it into a Transportation Security Administration officer. Now the Global Gateway Alliance wants to find this mysterious do-gooder and give him or her a round-trip flight voucher from United Airways for being so honest. If it’s you, you can email ring@globalgatewayalliance.org and include proof of travel date and time. The TSA will then verify you’re the right one using security footage. You’ve got until May 31, at which time the prize will go to charity. “While all of us wait in long lines, struggle with security protocols and hear horror stories of thefts by airport workers, it’s important to know that our fellow travelers have our backs and TSA agents work hard for passengers,” said Alliance Chairman Joseph Sitt. Previous Congratulations To Comcast, Your 2014 Worst Company In America!